Although the index recorded annual growth of 2.3% in the year to June, this modest performance remains some way off the double-digit growth seen pre-2008, suggesting that the prevailing economic conditions continue to impede growth. The performance of prime rents across global cities is intrinsically linked to employment, business confidence and recruitment. At the top end of the world’s rental markets corporate demand is increasingly influential, accounting for up to 85% of prime rental demand in some cities. As in the prime sales market, it is those cities that generate strong foreign demand that have seen the strongest uplift in rents since the global recession hit in 2008. Prime rents in London, New York and Hong Kong have risen by 25.7%, 23.9% and 35.6% respectively since their recessional lows. 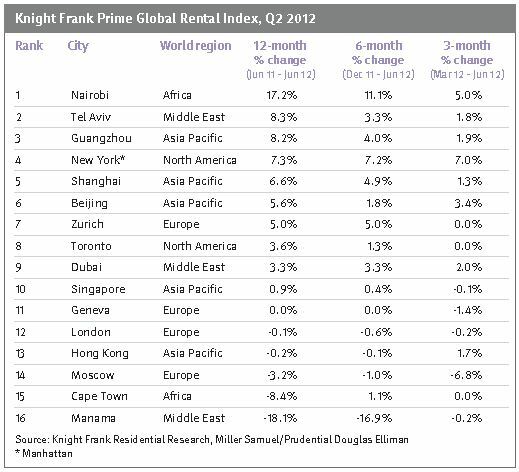 While the latest results show prime rents continue to push higher in New York, rental growth is weaker in London and Hong Kong. In Manhattan prime rents are at their highest since the recession. An improving regional economy, rising employment and strict bank lending has helped drive rents upwards as potential buyers have opted to rent until mortgage lending rules are relaxed. In Hong Kong and Singapore a heated sales market in recent years has seen prime prices rise by 76.5% and 31.2% respectively from their recession lows. Affordability pressures accompanied by rising interest rates and growing demand from foreign tenants have boosted prime rents. 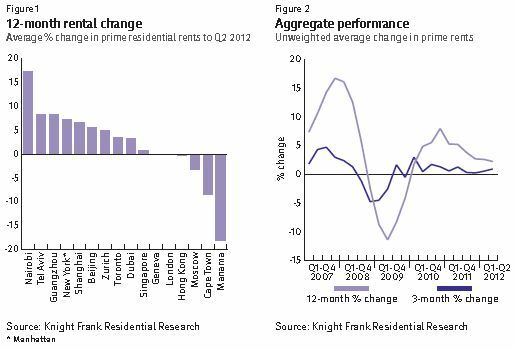 But rents in Hong Kong and Singapore still trail prices, with growth of 35.6% and 20.6% respectively over the same period. Future rental growth is likely to be focussed on the world’s developing markets as business globalisation increases. Nairobi, Tel Aviv and Guangzhou’s positions at the top of the rankings this quarter are not incidental. In sharp contrast to many western economies, Kenya, Israel and China are forecast to see chunky GDP growth of 4.7%, 2.3% and 7.8% respectively in 2012, due in large part to a surge in foreign investment. For a detailed overview of the corporate lettings market and for rental forecasts on a city-by-city basis please read Knight Frank’s Global Corporate Lettings Review. The Knight Frank Prime Global Rental Index is the definitive means for investors and developers to monitor and compare the performance of prime rental markets across key global cities. Prime property corresponds to the top 5% of the mainstream housing market in each city. The index is compiled on a quarterly basis using data from Knight Frank’s network of global offices and research teams.